If you’re like most people, you likely don’t think too much about the air in your home. Unless you smell something bad or it gets so cloudy you can’t see, it’s probably not at the top of your list. 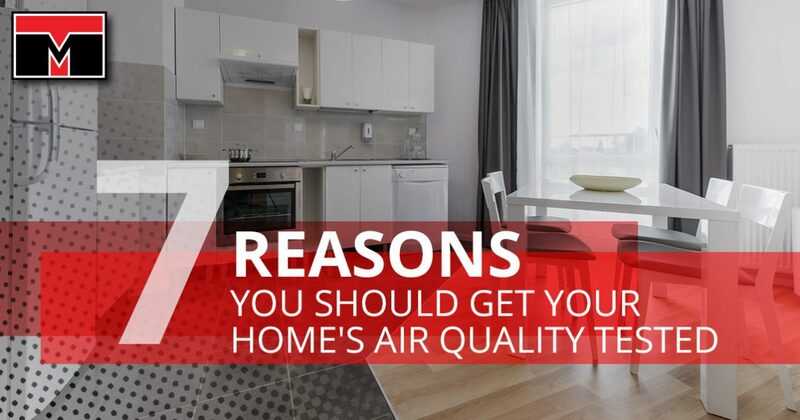 However, when your home has poor air quality, it can make you sick. With that in mind, we’ve gathered seven of the biggest reasons why you should have your air quality tested by an HVAC professional. For air quality testing here in Las Vegas, call Tippetts Mechanical. We have years of experience and knowledge to help your family breathe easier. If you do any cooking in your home, you’re filling it with gases and particles from combustion. These gases and particles are produced by heating stoves, cooking stoves, fireplaces, furnaces, space heaters, and tobacco smoke. Combustion releases pollutants such as carbon monoxide, nitrogen dioxide, and other particulate matter that is harmful to your health. Carbon monoxide can cause many symptoms, such as small headaches or nausea all the way up to confusion or unconsciousness. About 500 people in the U.S. die every year from carbon monoxide poisoning. Nitrogen dioxide can irritate the mucous membrane and causes breathing issues. Long-term exposure to nitrogen dioxide, even at low levels, can raise your risk of lung infections and emphysema. When airborne combustion particulates are breathed in, they can lodge in your lungs, which can damage the tissue and work themselves into your bloodstream. Because carbon monoxide is both colorless and odorless, the best way to keep track of it is with carbon monoxide detectors placed near bedrooms and any fuel-burning appliances. You also need to have those appliances inspected at least once a year by a qualified technician. Chimneys, flues, and air-handling systems should likewise be inspected to ensure they are not leaking harmful particulates into your home. It will be easier for you to see other combustion products than carbon monoxide. For example, nitrogen dioxide is reddish-brown and smells quite bitter. It is always recommended you use a fan or window to ventilate the area when using a stove, space heater, or fireplace. Right behind tobacco, the number two cause of lung cancer in the U.S. is radon, killing around 21,000 people every year. As it is also colorless and odorless, it is hard to tell when it sneaks into your home. Just about all soil contains low levels of slowly decaying uranium, which emits radon, though some areas have higher levels than others. While radon typically dissipates safely into outdoor air, it can seep into homes and buildings through cracks in the foundation. If left unchecked for too long, it can reach unsafe levels in basements and other lower level floors. To get an idea of your area’s general risk of radon exposure, the EPA put together a helpful map. However, that map does not stand as an end-all, be-all resource for what your home’s radon risk is. Due to the danger that radon can pose, it is recommended you contact a qualified radon inspector to test your home for leaks. Probably the most well known of dangerous inhalants, asbestos used to be used as a building material and insulator. Once it was discovered inhaling asbestos can cause lung cancer, mesothelioma, and long-term lung scarring, it was no longer utilized in construction. With that being said, if your home was built prior to the 1980s, it is possible your home still contains asbestos. Asbestos fibers only become airborne when they are disturbed, so this is especially important to test for prior to any home repairs. It is never recommended you attempt to handle asbestos on your own, as it is incredibly dangerous to work with. If you are concerned your home may have asbestos, you need to contact a professional inspector as soon as possible. You can find volatile organic compounds, commonly referred to as VOCs, in everything from paint and glue to printers and shower curtains. VOCs have low boiling points, which means they can emit a lot of vapor even at room temperature. Some VOC vapors can cause short-term health problems such as headaches or nausea, which are often grouped together and categorized as “sick building syndrome”. Other vapors can lead to long-term issues like brain damage and cancer. The EPA reports that the average levels of some VOCs can be up to five times higher indoors than outdoors, and they can dramatically increase even higher than that. For instance, after several hours of paint stripping, the indoor volatile organic compound levels can rise to nearly 1,000 times the average level for outside. Because of this, it is recommended you use products that contain VOCs as sparingly as possible, and always with plenty of ventilation if you’re unable to use them outside. Because there are no federal standards for VOCs in the home, it can be difficult to test for them. However, as some VOCs like formaldehyde can cause cancer, it is still important to be cautious of them. It is recommended you speak to a professional regarding VOC testing, as they will be able to accurately gauge their levels and assist you with improving your home’s air quality. Most often found in humid areas of the home, like bathrooms and basements, mold and mildew can create many health issues. Depending on what type of mold and how sensitive a person is, mold can cause symptoms like nasal stuffiness, wheezing, and irritation of the skin. When children are exposed to mold, it can result in the development of asthma. If you notice mold or mildew developing in an area of your home, you can use a dehumidifier or fan to dry out the air and prevent it from spreading further. You can remove some mold from hard surfaces with soap and water, a bleach solution, or hydrogen peroxide depending on the severity. As each situation can change depending on a variety of factors, an air-testing company will be able to test for mold and provide a course of action for how to take care of it. When it comes to biological pollutants of indoor air, mold isn’t the only one you need to worry about. Dust mites and cockroaches can both leave a trail of allergenic feces and body parts. Breathing problems can result from fumes produced by rodent urine and droppings, as well as pet dander and the airborne proteins from a cat’s saliva. You may also be dealing with pollen and bacteria from outdoors. These pollutants can all cause allergic reactions and asthma attacks, with symptoms worsening with continued exposure. Children and elderly people are particularly affected by these biological interlopers, so if you have either living at your home, it is vital you handle these issues quickly to avoid larger health problems. While air quality testing can pick up biological pollutants, you’re often better off using visual cues. If you notice rats, roaches, or their droppings on a regular basis, it is a good sign that you have an infestation on your hands and should contact pest control to get rid of the problem. Good housekeeping and good ventilation will both be incredibly helpful to avoid these common allergens from reaching high levels of concentration. While it is true that rodents and insects commonly cause a great deal of indoor air pollution, attempting to eradicate them with poisons can create larger, more dangerous problems. Pesticides by their very nature are toxic, containing organic compounds which add to already present levels of airborne VOCs. Depending on the chemical and how much is used, symptoms can range from headaches and nausea to long-term brain damage and an increased risk of cancer. With nearly three-quarters of U.S. households using at least one form of pesticide in the past year — mostly insecticides and disinfectants — they can account for nearly 80 percent of most people’s total exposure to pesticides. Because of the danger they present, it is recommended you use non-chemical alternatives. Even if you haven’t recently used any pesticides, if they are improperly stored or tracked inside from a treated lawn, the chemicals can still raise your home’s pesticide levels. Even something you might think is harmless, like mothballs, carry a dangerous chemical called paradichlorobenzene, which has been shown to cause cancer in lab animals. While not all of these pollutants can be perfectly tested for in an indoor air quality test, it is important you are aware of the dangers they can present to you and your family. However, many other issues can be properly diagnosed and treated after an air quality test. If you want to gain some peace of mind and fresher air in your home, call Tippetts Mechanical today to schedule your indoor air quality test. Our qualified HVAC experts will be able to explain your results and provide helpful tips for how you can improve your air quality. Whether it’s getting your ducts cleaned or installing an overhead fan above your oven, cleaner air is within reach for you. We hope to hear from you soon!